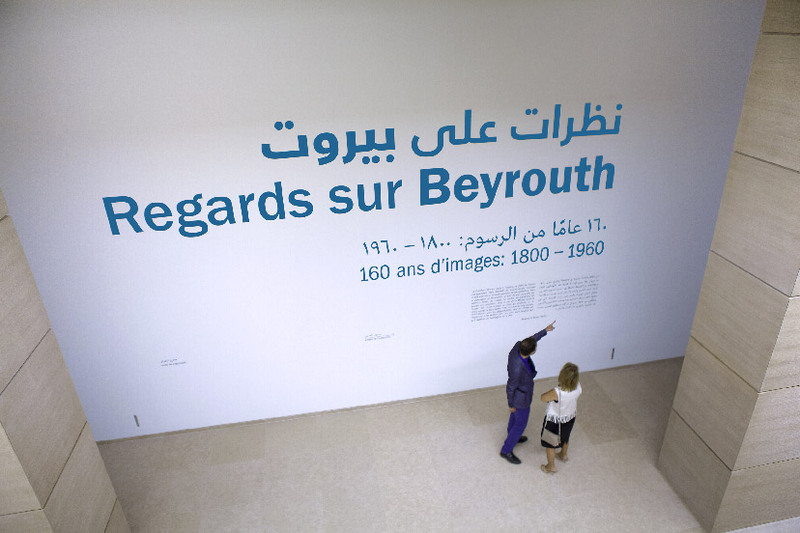 The story of Sursock as a cultural institution began when Lebanese collector Nicolas Sursock, recognizing the need for institutional support of artists in Lebanon, left his mansion to the city of Beirut as an art museum upon his death in 1952. 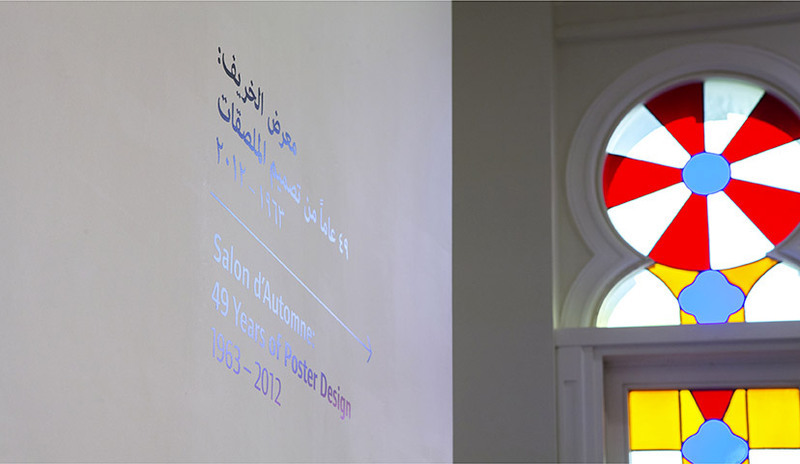 The Museum officially opened its doors in 1961 with the Salon d’Automne, an open call exhibition showcasing new art of the time, that was held regularly alongside a set of diverse exhibitions throughout most of the Lebanese Civil War and until 2008, the year the Museum closed for a major renovation and expansion. 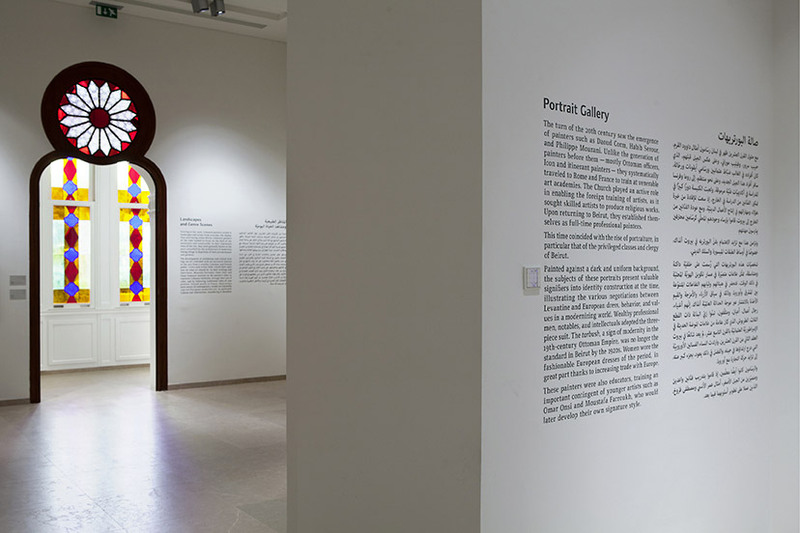 The works aimed at repositioning the Museum as a cutting-edge art institution, and were paralleled by the revisiting of the Museum’s identity, signage, exhibition and communication design in preparation for its grand reopening in October 2015 – a task as monumental as the architectural icon itself. 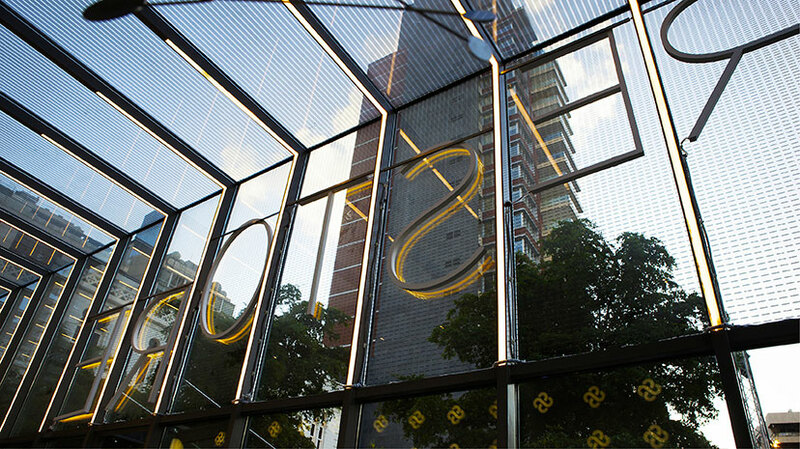 The structure of the revisited mark for the reinvented Sursock Museum aligns the bilingual name with the central floral emblem. 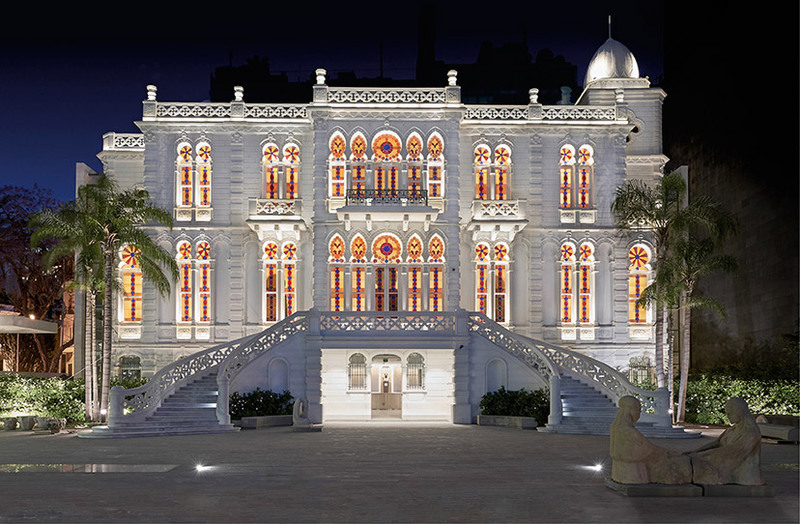 The Sursock Museum building, Nicolas Sursock’s former residence built in 1912, integrates Venetian and Ottoman elements that were typical in Lebanon at the turn of the century and is classified as a class A historical building by the Directorate General of Antiquities. 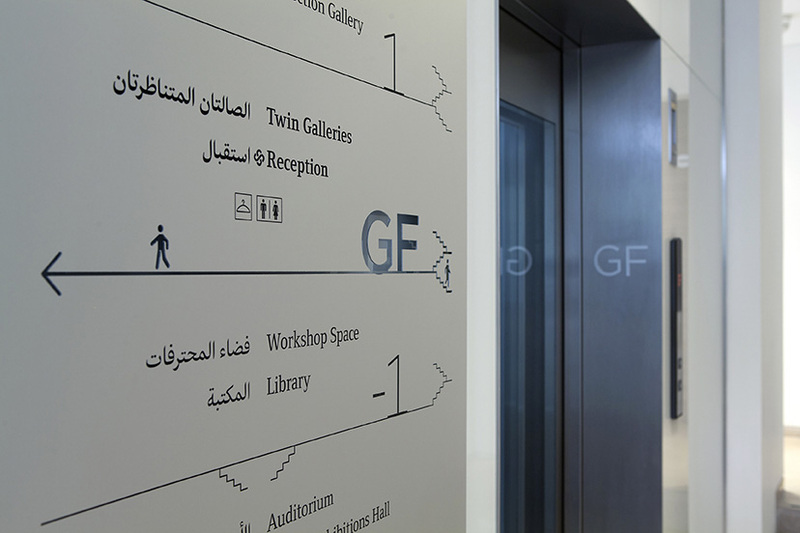 Sursock Museum’s anodized aluminum signs deploy a combination of silkscreened and cut-out treatments, as well as pictographic, diagrammatic and typographic elements that make it possible to integrate directional and identification information within a floor directory. 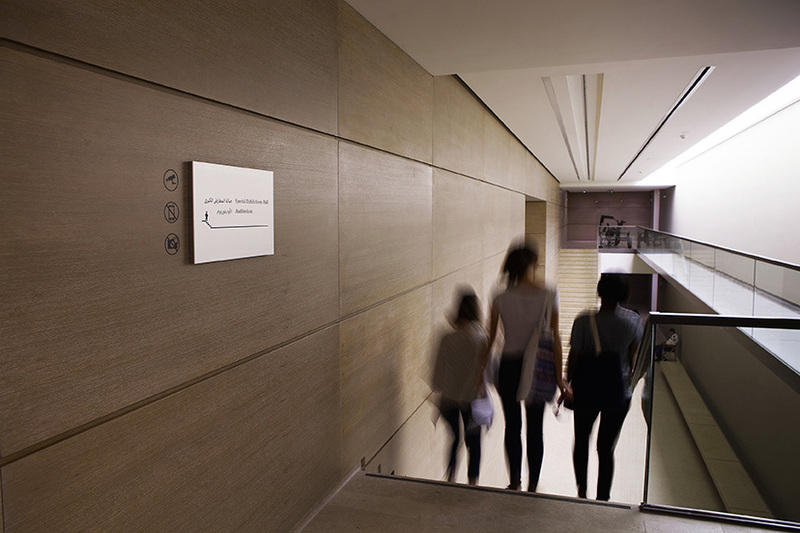 The anodized aluminum, used here for the Sursock larger identification signs, subtly reflects the shade of the surrounding material on which it is also mounted. 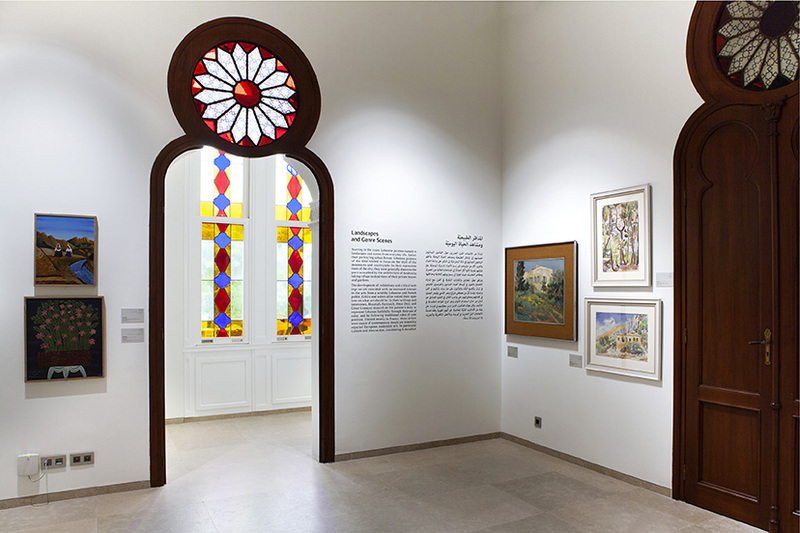 The Sursock Museum exhibition design elements – from wall texts to art work captions – often find themselves within a mosaic of beautiful things. Sursock’s below ground Special Exhibitions Hall is the Museum’s grandest both in terms of space and the exhibitions it hosts. This particular up-down vantage point calls for an equally grand announcement. Whether permanent or temporary, each of Sursock Museum’s exhibitions acquires its own particular identifying features while remaining true to the general communication scheme. 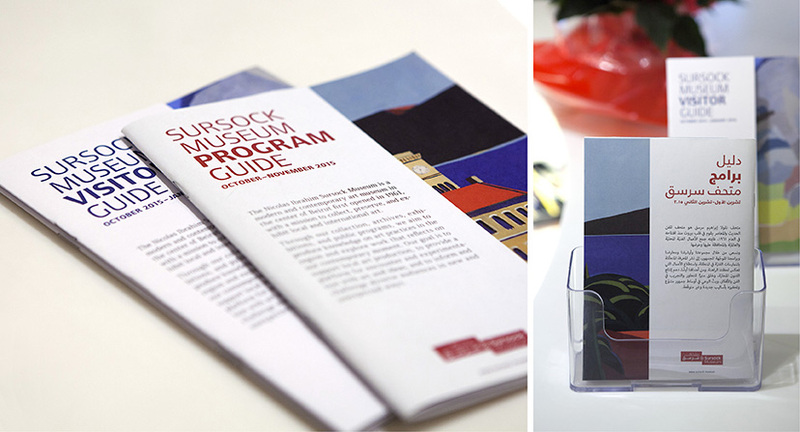 Sursock’s visitor and program guides are the essential printables for planning the visit and carrying it through. 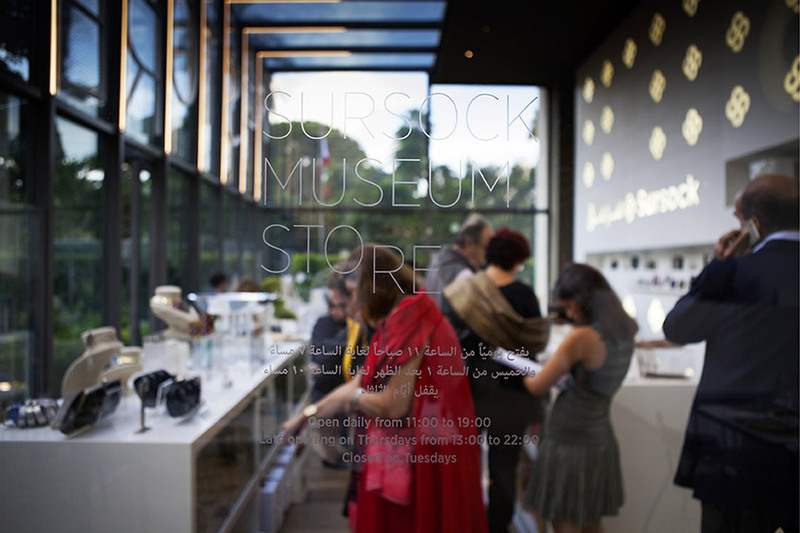 The Museum garden is itself an exhibition space for some great sculpture works, and hosts the Sursock café (Resto) as well as the Museum Store. 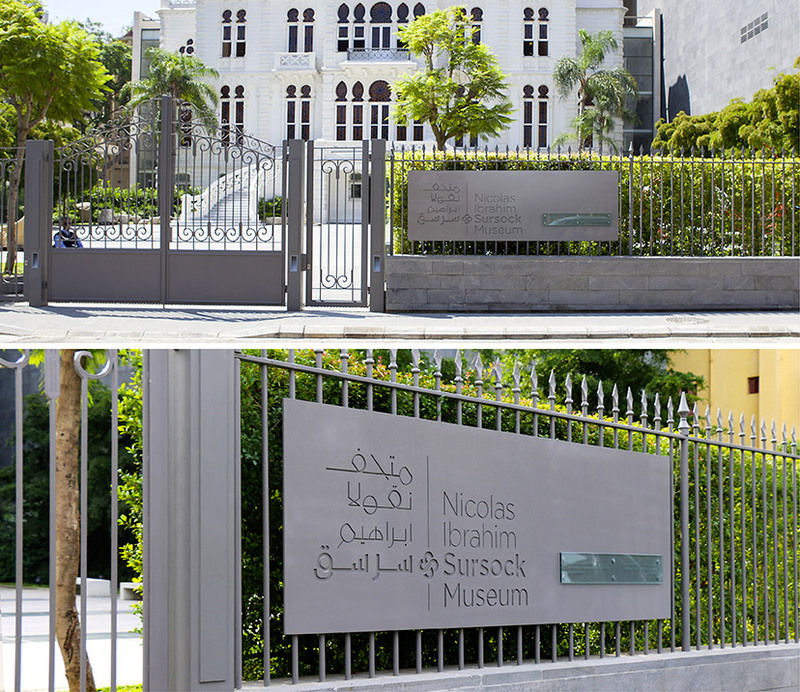 The shared LED sign for the Sursock Museum Resto and Store alternates between the two when both are operational, can stop at one or the other when needed, and takes a much needed “rest” when both are closed. In addition, the full group of letters (never seen all lit at once) spell the word “restore” which has direct pertinence to the Museum’s history and practice. The typographic signatures of Resto and Store are complemented by illustrations and Sursock Museum’s emblem-as-token respectively. 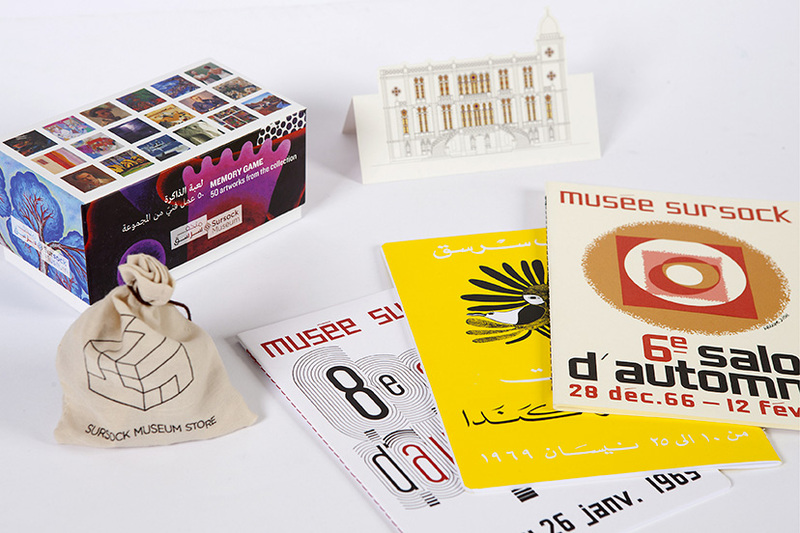 As part of the bigger mission for Sursock, a number of items were designed and developed for the Museum Store. At once a historic and a public institution, Sursock Museum required a multiform yet coherent revisiting of its identity, one that celebrates the cultural, architectural and institutional heritage while also addressing the local and international public clearly and efficiently. 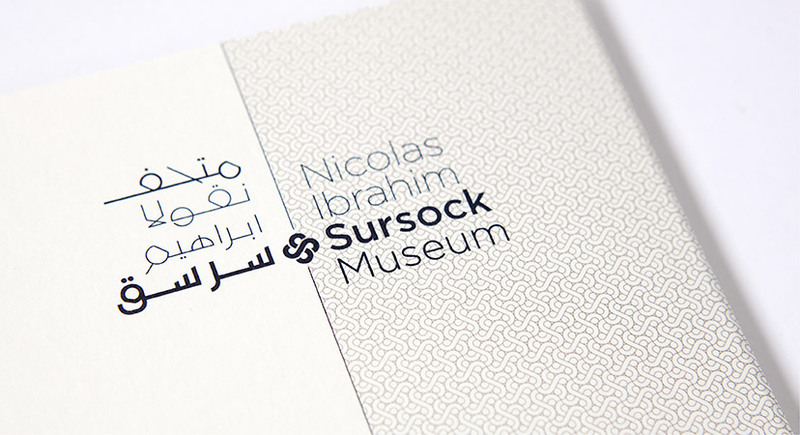 The identity system is centered around the Museum’s original floral emblem – an ornamental feature from the mansion’s iconic staircase – and is injected with a contemporary typographic aesthetic and a custom-drawn Arabic calligraphy designed in collaboration with artist Samir Sayegh. 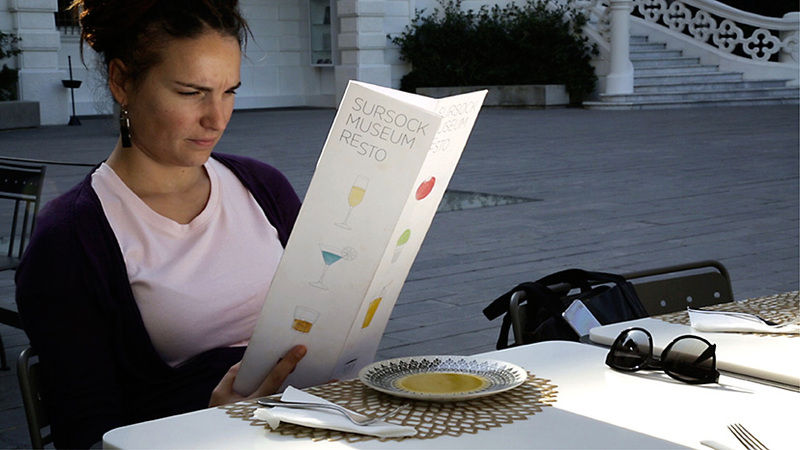 The institutional version of the identity is reserved for operations of an official nature – as well as the Museum’s main sign – while the communication rendition is a simplified visualization capable of adapting to the diversity of events within the Museum’s rich program and the many media and communication channels it utilizes to interface with its audience. The set of Sursock marks includes a framed communication logo, an institutional logo which operates in two languages at a time, and a Museum seal as the official administrative signature. 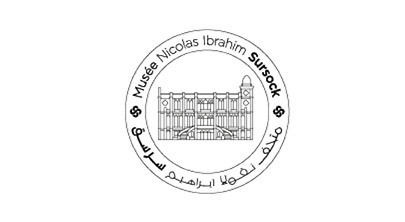 The floral emblem from the previous Sursock Museum logo is retained, and its detail readdressed to fit the more contemporary typographic/calligraphic scheme. The margins, alternating between left and right on the Sursock Museum stationery, indicate the alternation between Arabic and Latin scripts that flow in opposite directions. Fixed on the margin line, the Sursock floral emblem can appear on its own as an identity token, and is the basic module for the pattern construction. Surock’s back-to-back notepads pay attention to the difference between the conventionally ruled Arabic note book and the gridded English one. The Museum seal reproduces the cherished façade of the building, simplified for the inked stamp to retain most of its detail. 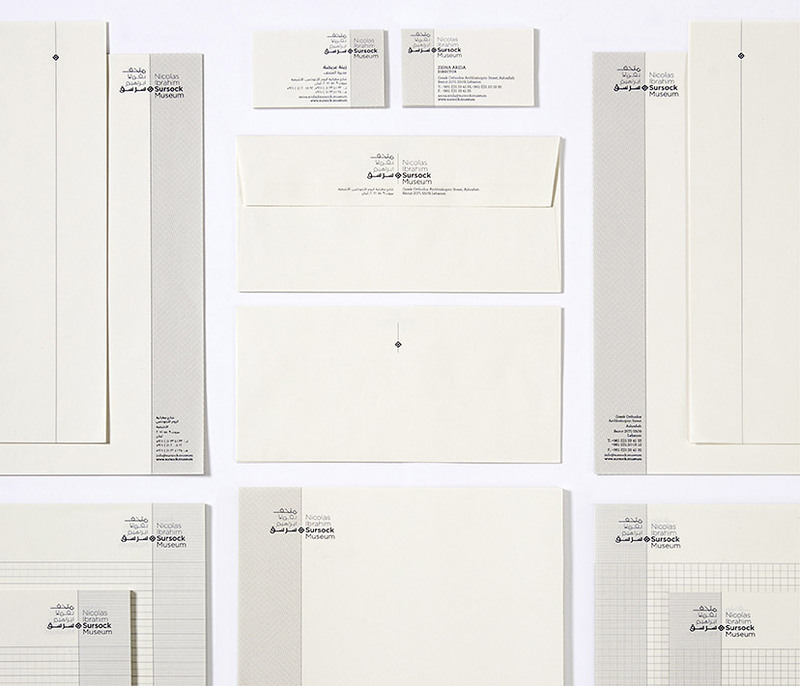 The seal – only to be used as an inked stamp and at a specific scale – complements rather than duplicates the existing logo on the letterhead. For the communication material, the Sursock signature is an adaptable version that can take on an array of visual scenarios. 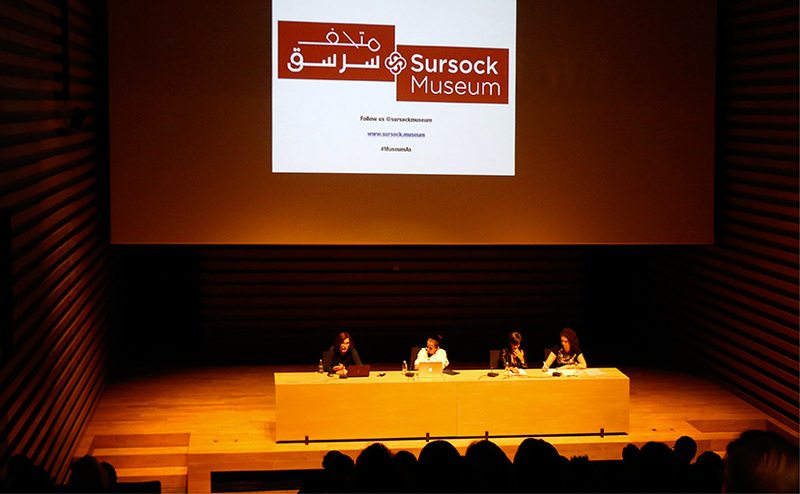 Remotely or in person, it is the communication version of the Sursock logo that primarily interfaces with the public. 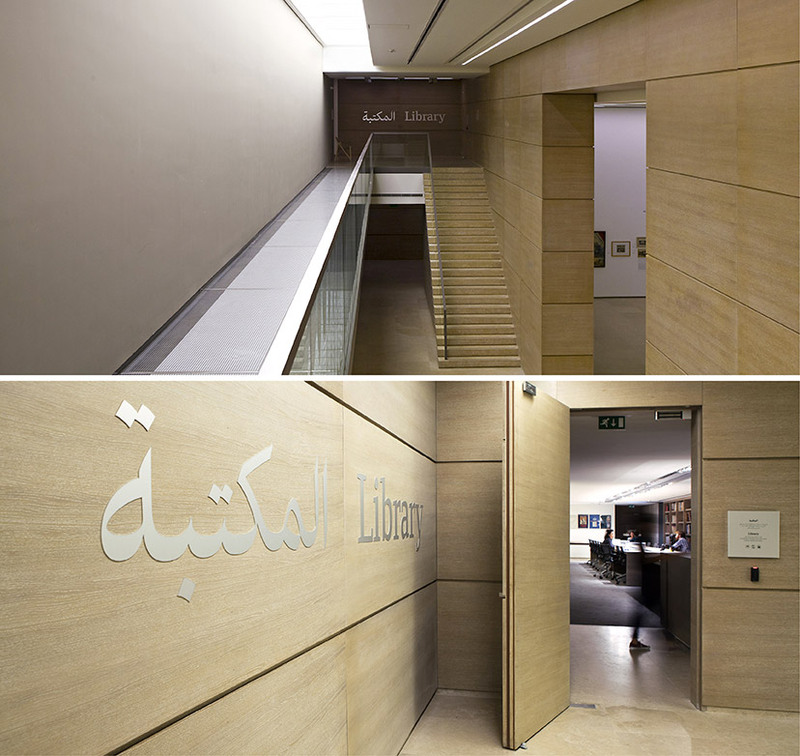 The expansion of Sursock (2008-2015) added four floors beneath the Museum garden, resulting in a fivefold increase in the total surface area and the creation of new facilities including additional exhibition spaces, an auditorium, a research library, two storage spaces for the Museum’s permanent collection and archives, and a restoration workshop, as well as a store and café/restaurant. This new spatial configuration required a detailed assessment of the circulation flow in order to propose a comprehensive way-finding system with carefully placed directional, identification, location and regulation signs. 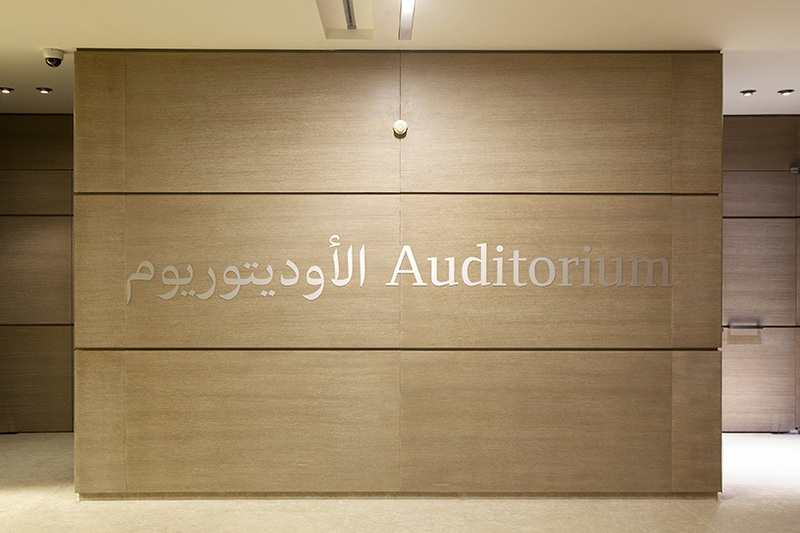 The signage scheme primarily uses silkscreened, laser-cut and folded panels of anodized aluminum, a material chosen for its ability to react to and absorb the various tonalities of the Museum’s interior surface treatments: from wood panelling to grey or white painted walls. In total, 67 individual signs were produced and no two signs are completely identical. 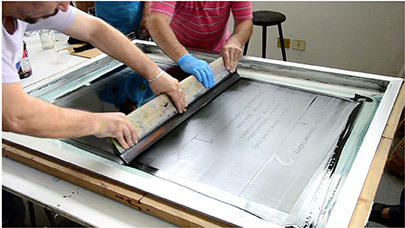 Silkscreening the Sursock signage panels at Béchara Fayad’s Interprint. The expansion of the new Sursock Museum is mostly underground, with additional circulation spaces added on each side of the main building. The central entrance and symmetrical vertical navigation largely informed the planning of the way-finding system. 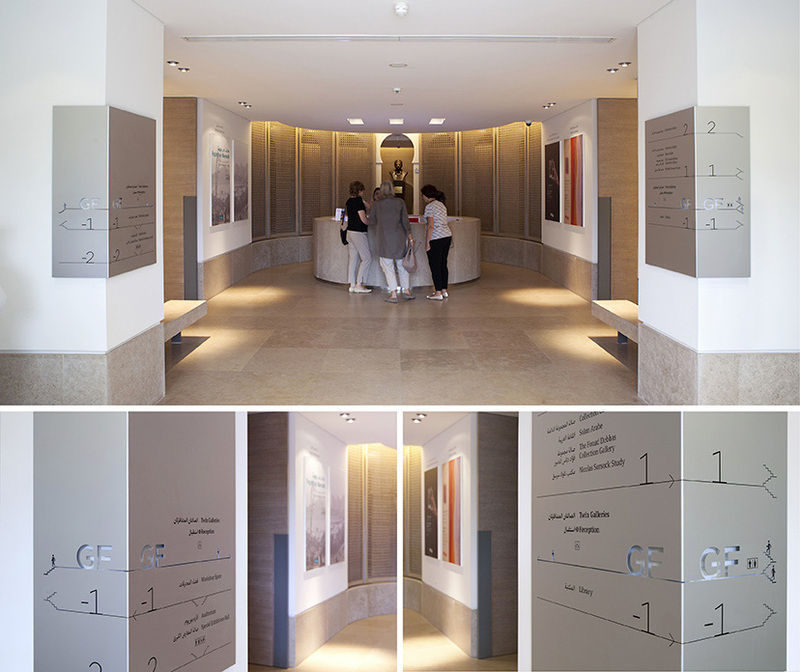 The floor directories on either side of the Museum’s entrance give a direct indication of the building’s main navigational routes. 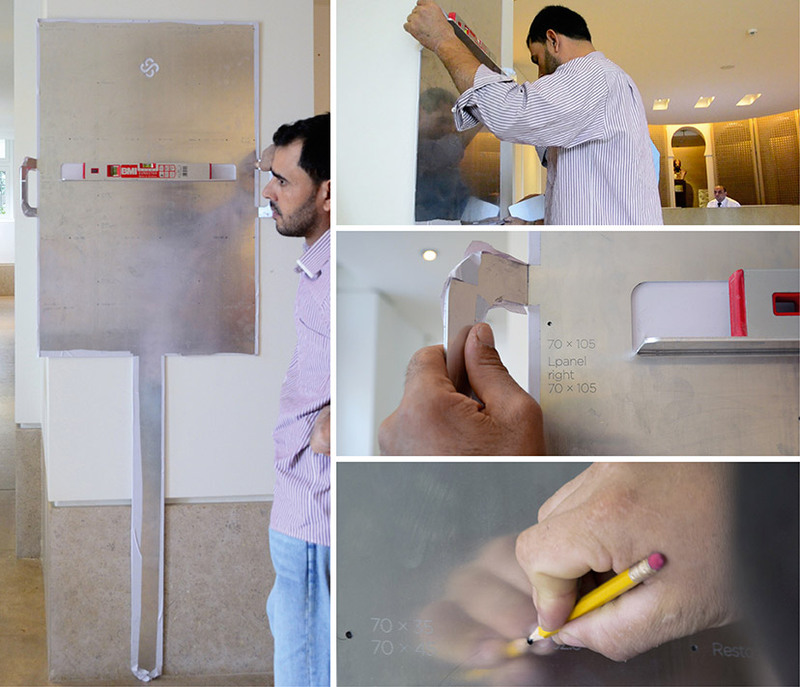 A tool incorporating a level and indicators for the screw hole positions of all panels was designed for an accurate and efficient installation of the signs. 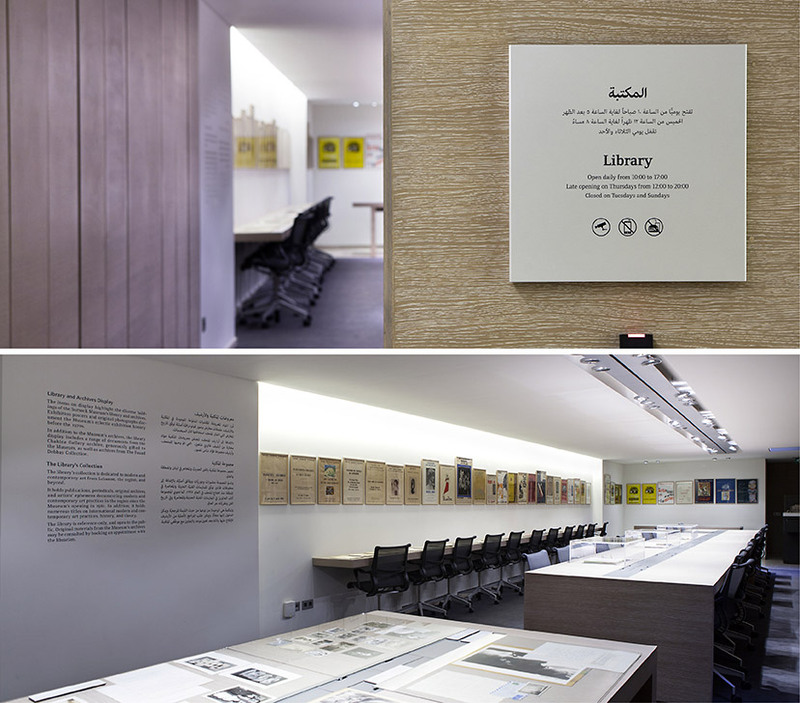 The floor directories, incorporating cut-outs, as well as pictographic, diagrammatic and typographic elements are Sursock Museum’s main way-finding devices. 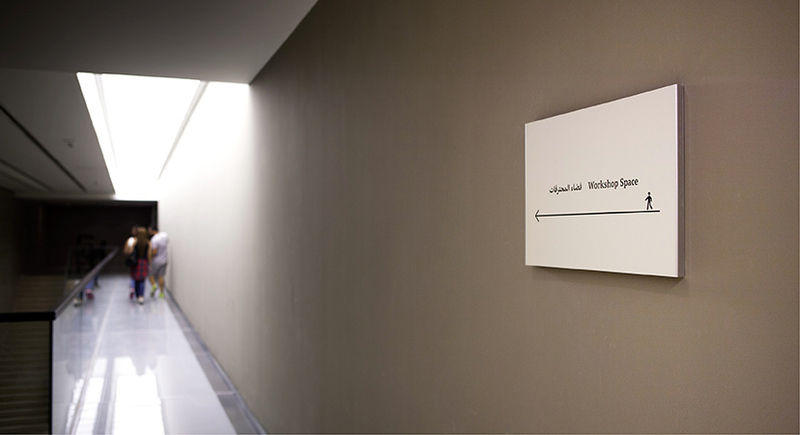 The details of the Sursock signage language transform simple arrows into section diagrams with micro navigational information. 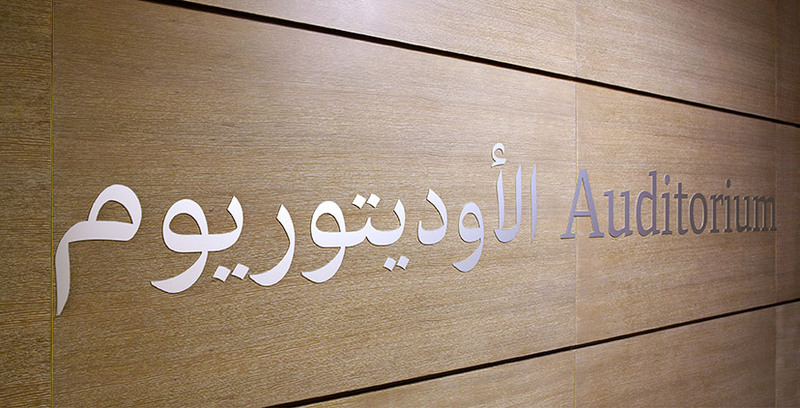 The anodized aluminum used for the Sursock signs reacts to daylight in a way that further emphasizes the cutout highlights. Vinyl regulation signage supplements the navigational component of the signage system. 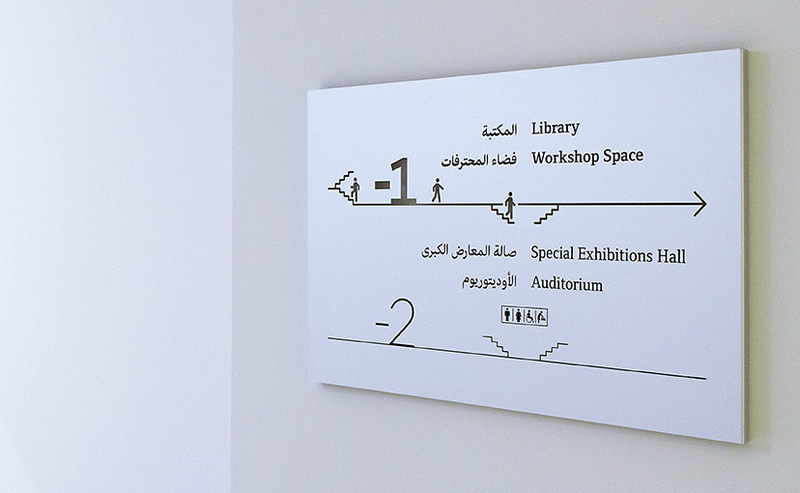 Identification signs range between text signs, sometimes with additional information, and straightforward pictograms. For the Museum’s main facilities, identification acquires a bigger and louder presence. Large and perfectly centered within the wood panels, the identification signs for the main facilities command their share of attention. Installing the Collection Display captions with utmost precision. 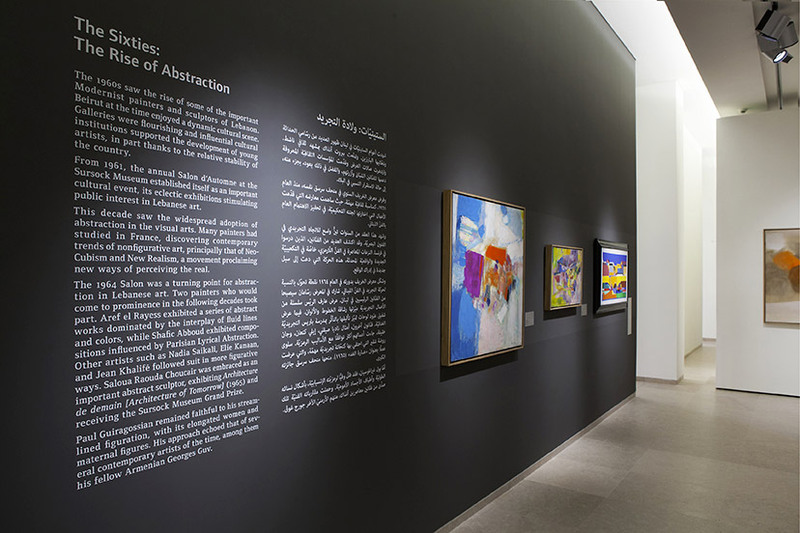 “Hommage au tapis volant”, a 1965 painting by Aref el Rayess, was chosen as the main visual for the Collection Display exhibition. 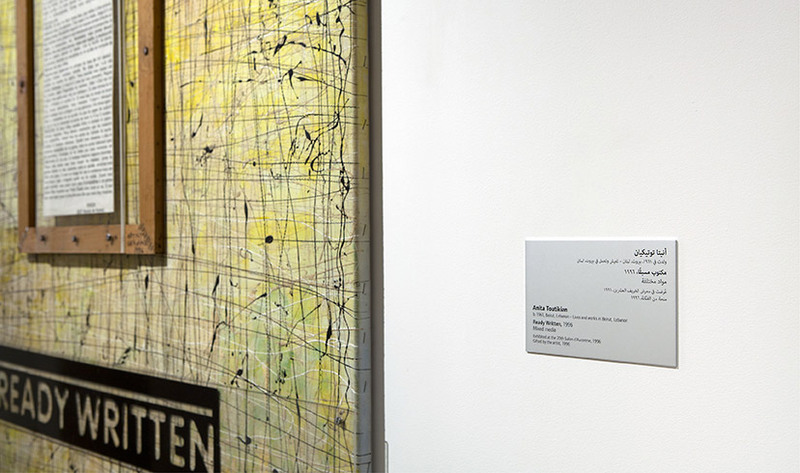 The Collection Display captions are set on the same iodized aluminum used for the Museum signage system. The exhibition space alternates between white and dark grey walls. The light from Sursock’s stained glass windows transforms something as simple as black vinyl on a white wall into a reflected spectrum. The posters of 49 years of Salon d’Automne, the previous Museum’s most regularly held exhibition, are part of the Collection Display. The Collection Display extends into the Museum library with posters, original photographs and other archival documents. 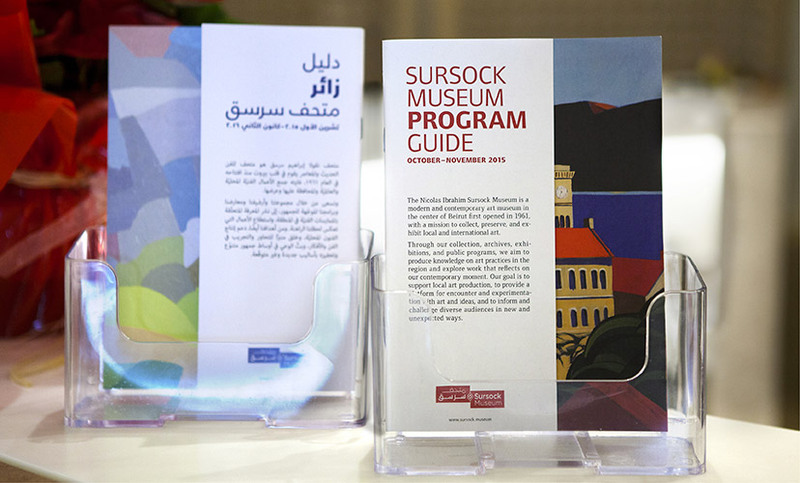 The reopening of Sursock in 2015 marks an increase in the Museum’s activity in terms of both number and diversity of events. With an ambitiously rich and changeful programming, the adeptness and adaptability of the communication approach is crucial not only to clearly inform the public of frequently updated happenings, but to also build a systematic language that operates equally well outside the Museum as it does within its walls, and as effectively in print as on screen. The comprehensively bilingual (and sometimes trilingual) content is a contextual necessity in Lebanon, and adds yet another challenge to the communication scope. 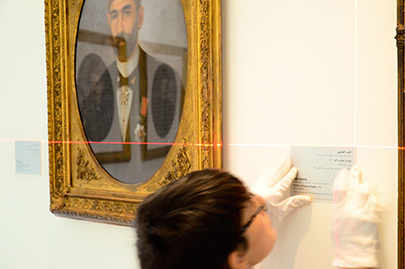 The Sursock Museum communication signature readily dresses up for the occasion. In anticipation of the grand reopening of the Museum, a save-the-date message provides the proper tease. With four shows opening at once, the invitation card for the Museum reopening supplements the classical official message with a four-part detachable card. 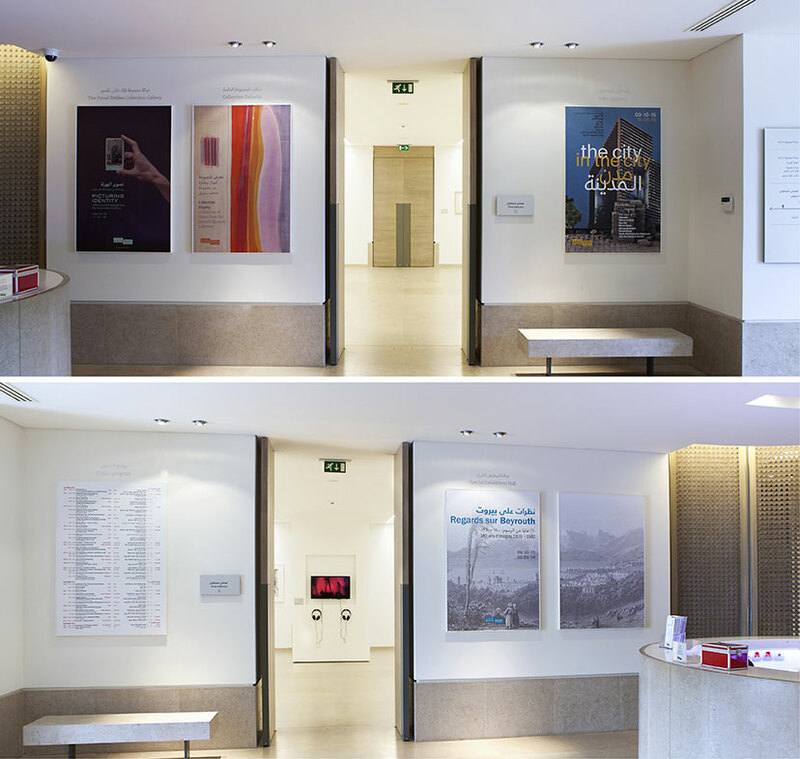 The exhibitions, both on show and upcoming, as well as the public program, are announced on both sides of the Museum lobby. 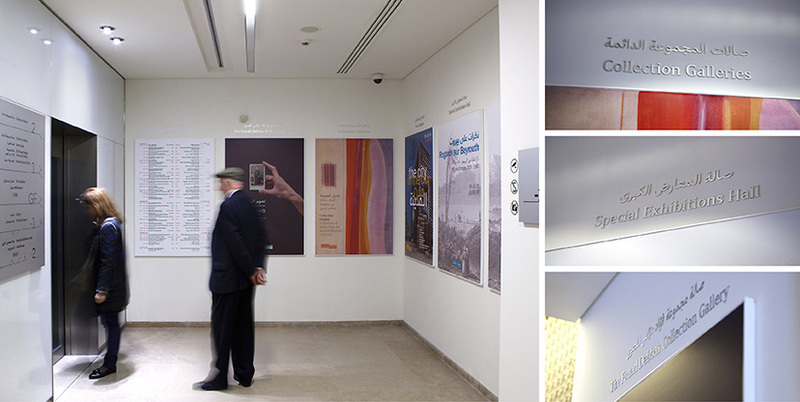 On-site posters communicate on exhibitions and their respective spaces in the Museum. 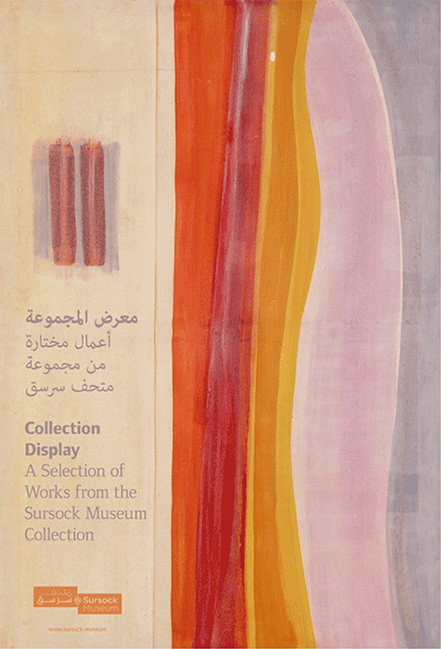 The Museum program guide’s two covers – a side for English and the other for Arabic – have an overlay revealing only part of the cover art work which extends across both. 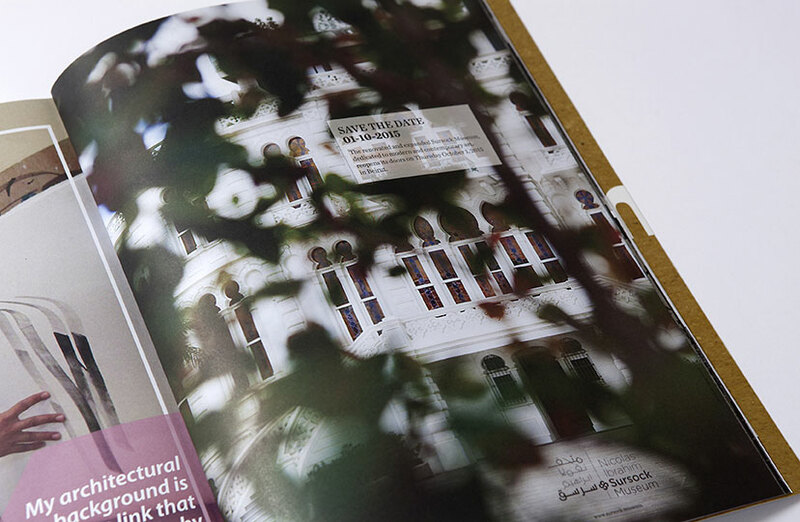 The Museum visitor guide includes a central fold containing the Museum plan on the inside, and on the outside the cover art work continues across the Arabic and English double cover, partly hidden by the guide pages themselves. 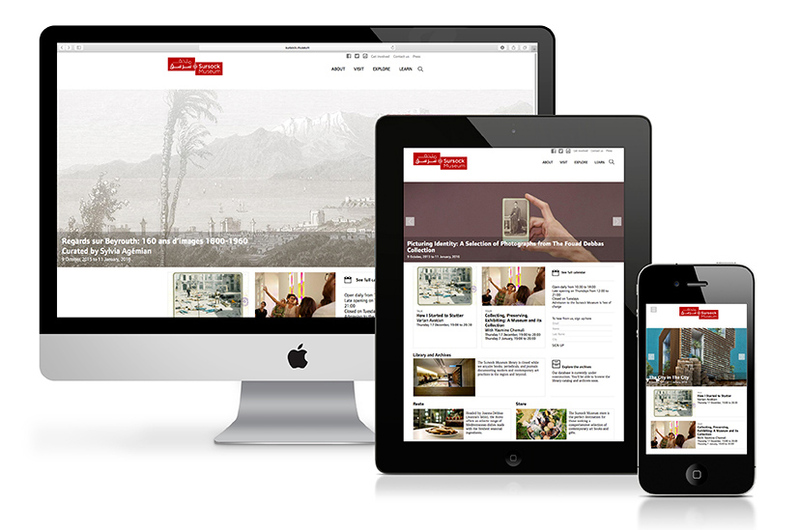 The subdued website language – with a restricted use of red for primary highlights – allows the diverse and rich Museum visual content to do its thing. Located within the beautiful exterior garden, the Sursock Museum restaurant and store are destinations in their own regard, and were accordingly given their own visual treatment. 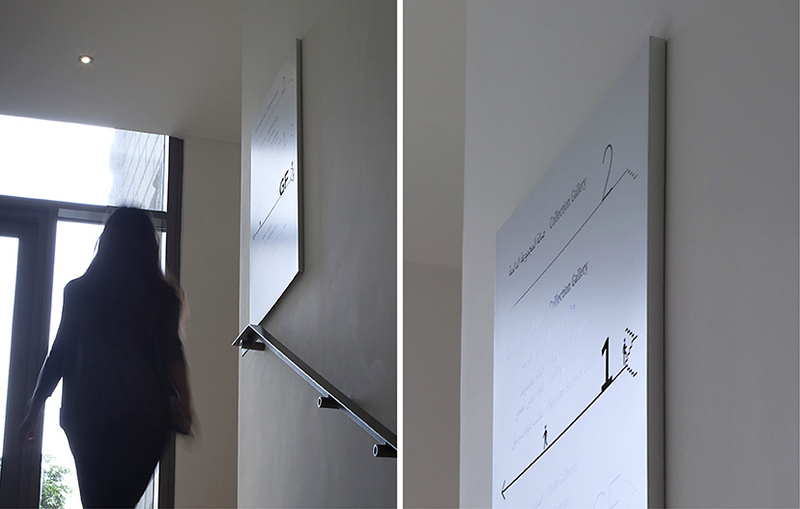 A simple yet malleable typographic device was created, one that can act independently for either the Resto or the Store, but that can also operate in unison, generating an engaging play with letters and words that amusingly works on multiple levels. 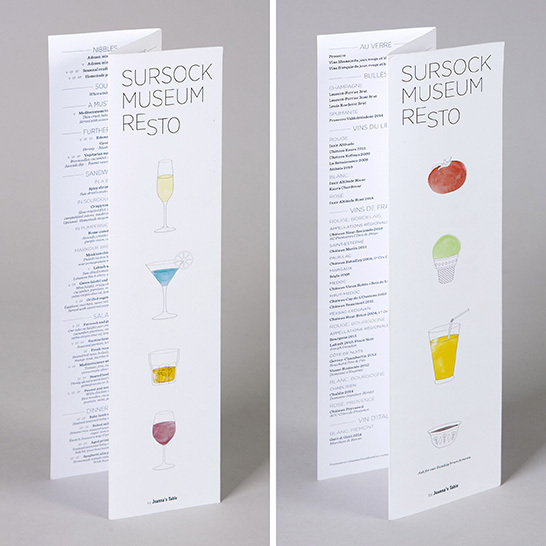 For the Resto, which offers an eclectic range of Mediterranean dishes made with local produce, a set of illustrations complements the typographic mark. And for the Store, where one can find art books and publications as well as souvenirs and custom-made designer items, a merchandising strategy was developed and a number of museum-produced objects were designed in addition to the key store amenities. 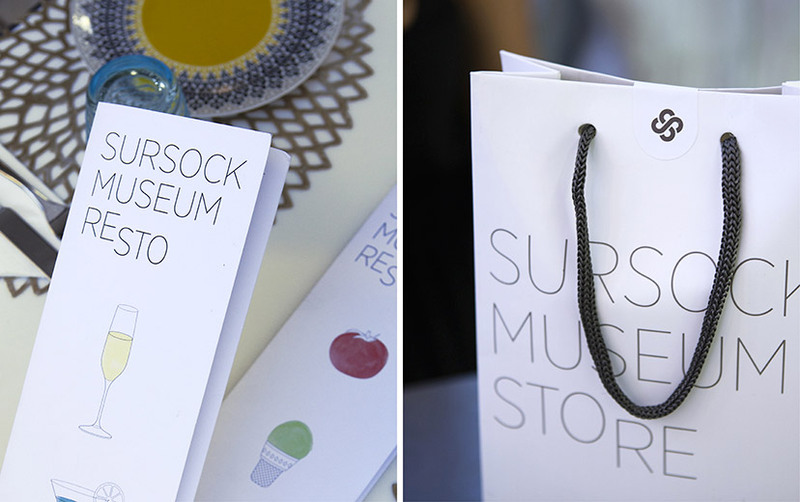 The shared spaces of the Museum store and café inspired a composed logotype which can alternate between the two. The letter sequence in RESTO – a common French abbreviation of restaurant – and STORE is a lucky one to say the least. It’s hard to miss how the RESTO/STORE composed logotype actually spells RESTORE, even in mirror image as it is here in the main sign seen from the inside. Between the finely detailed building illustration, the delicate pattern and the floral kiss at the end, it’s easy to see how preciously Sursock STORE treats its items on offer. The custom-designed holder for the STORE’s product display tags allows for easy visibility on both low and high shelves. The illustration on the bag of this mini construction toy tells you what you should aim for. 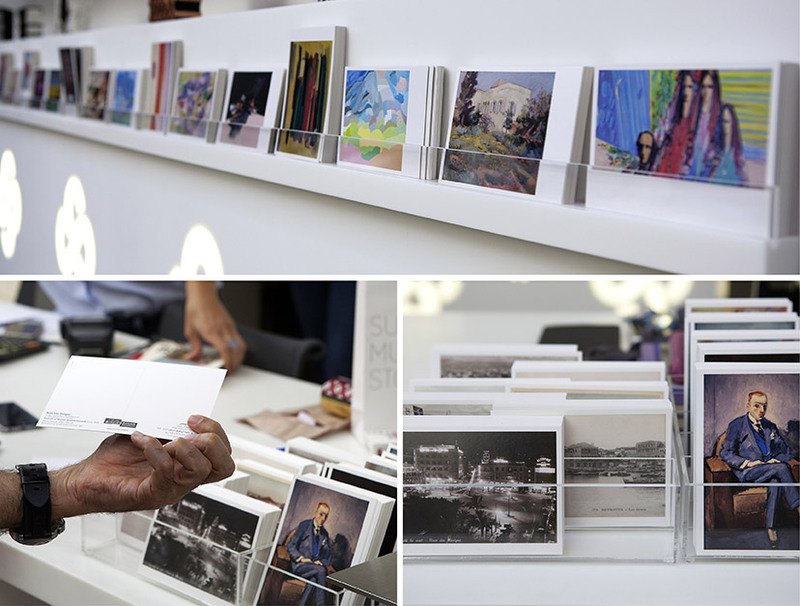 No museum store is complete without mailable art. 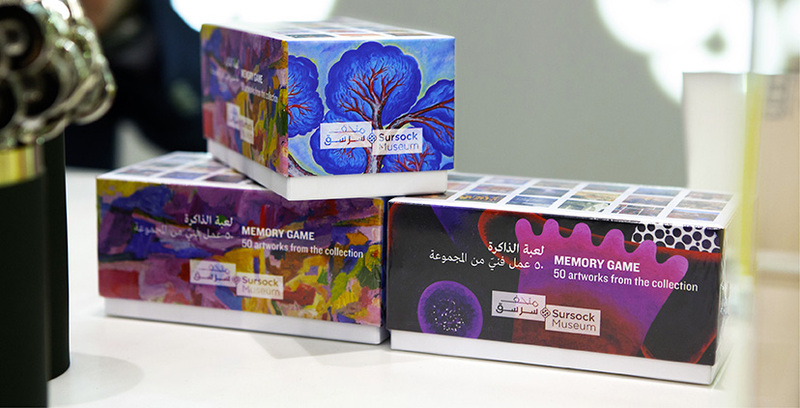 A classic memory game with works from the Museum collection was developed for the STORE. Reproductions of exhibition posters from the Museum archive on thread-stitched notebooks are about the Museum’s history as much as they are about great graphic design. Most of the posters from the Museum archive had French and Arabic versions. Used here as double covers of the notebooks that celebrate them, they give the user a language option and reveal some interesting calli-typographic relationships. 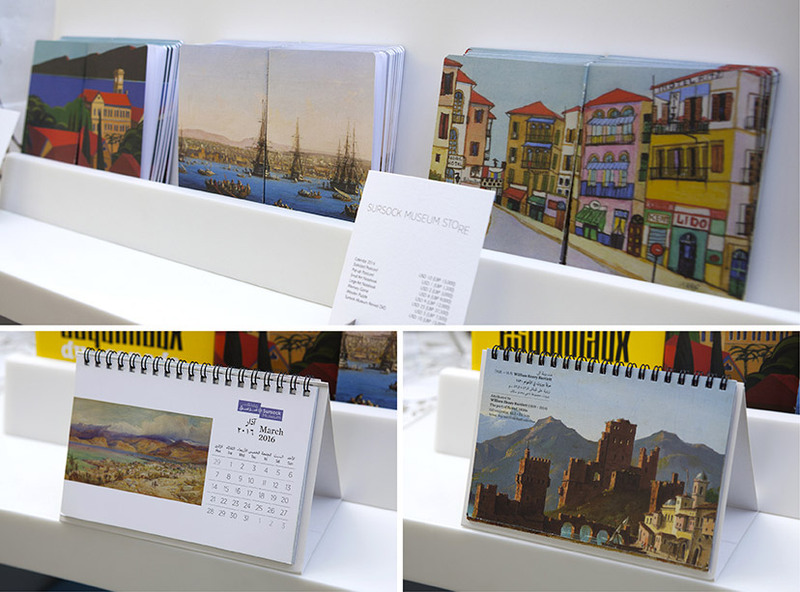 The 2016 calendar and some accompanying notebooks are focused on “Regards sur Beyrouth”, the main show marking the reopening of the Museum.